This week’s Garden Bouquet of the Week is purple monkshood (Aconitum arendsii), Gomphrena ‘Zazzle’ (the glowing starburst of magenta in the center), yellow Jerusalem artichokes (a perennial sunflower with edible roots), ‘Tardiva’ tree hydrangea, fresh flowers on Hydrangea ‘Endless Summer’, goldenrod, culinary sage foliage, surprisingly fragrant pink Sedum blossoms, spikey pink Persicaria, and Aster laevis ‘Bluebird’ and Aster oblongifolius ‘Raydon’s Favorite’. 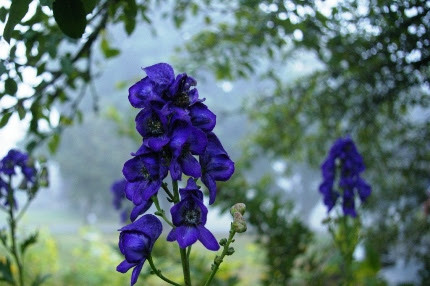 Fall monkshood is a very long lasting perennial that struts its stuff in late September and October. Related to Delphiniums but much easier to grow, Aconitum arendsii grows 5-6′ tall and lasts for a week as a cut flower in a vase. This photo was takenMonday morning in the mist. Monkshood has spread throughout my borders; this one is growing under the canopy of a pear tree. Yes, they will grow in partial shade!